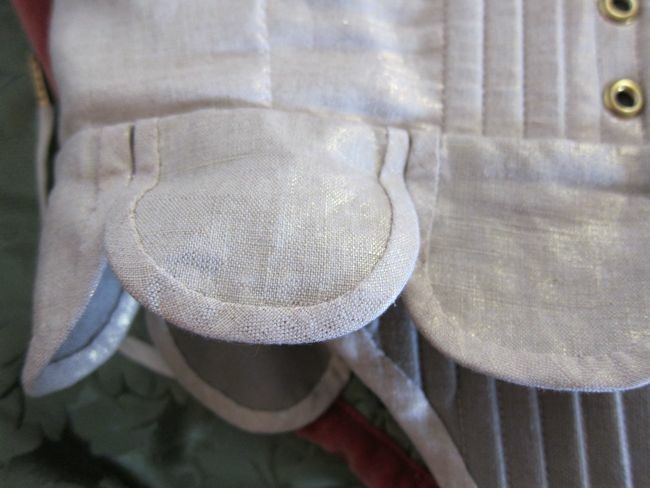 Despite being a self-confessed magpie, I’ve gone for something quite subtle for the ‘All that Glitters’ HSF challenge: a pair of bodies (Elizabethan stays/corset) in gilt linen. 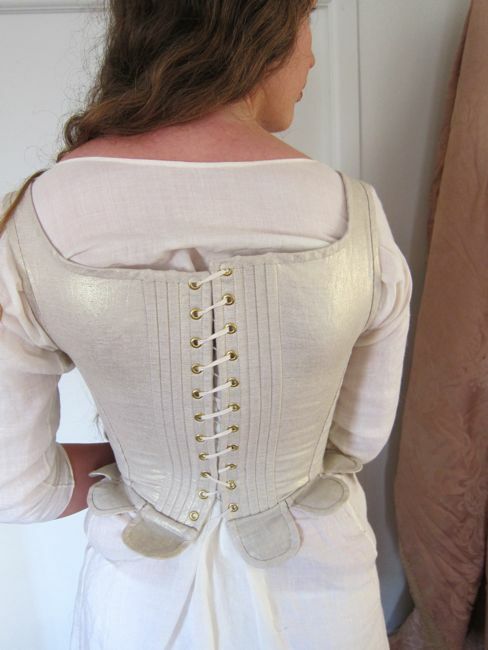 The linen is the same fabric that I used for my 1770s silver linen stays, because I have a LOT of that linen, and couldn’t find a single other piece of fabric in stash that said ‘make me into a pair of bodies’. Sometimes you just have to listen to the fabric. 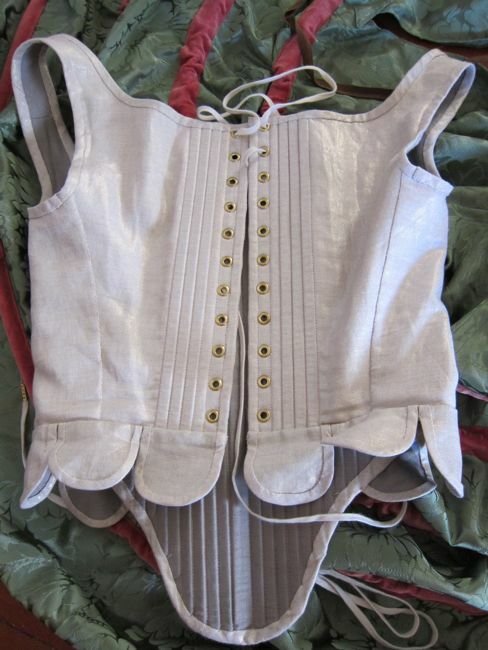 So now I own two historical corsets in gilt linen. 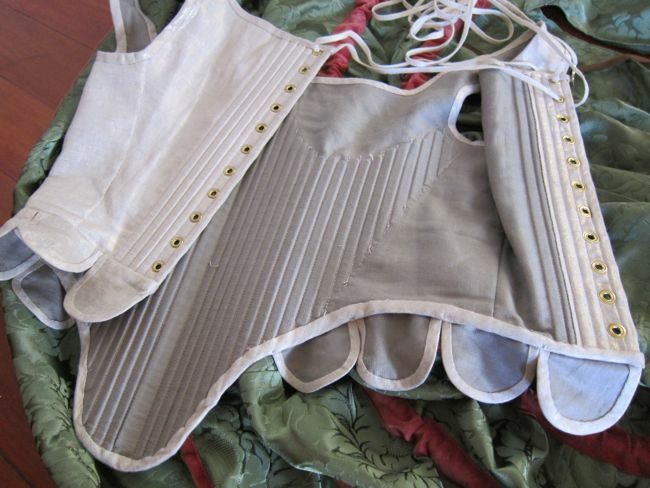 Gilt linen is a slightly dubious fabric choice for a 16th c. pair of bodies, but I’ve made these as a very nice working toile (I’ve even, gasp.shock.horror, used metal grommets for the back lacing), so I’m OK with a bit of inaccuracy. And they do look rather smashing in it! When I tried the mostly-completed pair of bodies on I realised that 1) I actually really love them (I had extreme doubts about Elizabethan fashion in the first place, and the un-boned bust sections of these stays in particular), and 2) they look like something that would have been worn as part of an Elizabethan masquerade costume for Hippolyta, Queen of the Amazons. Golden (well, gilt) girdle? Yep. Armor like? That too. Suggestion of bound/removed breasts? Check. Now I just need a really awesome bow & arrow and an Elizabethan masquerade to go to! The unboned bust sections that I was so dubious about are fantastic. They make the bodies so much more comfortable than a fully boned pair would be, and provide uplift without squashing my modest bust into oblivion. The bodies have a vintage Japanese wooden ruler as a busk, and are primarily boned with cable ties. Cable ties are cheap, accessible, one of the best modern approximation of whalebone, and (most importantly) I already had a couple hundred in stash from a bulk-buy a few years back, and sewing from stash is definitely a consideration at the moment. 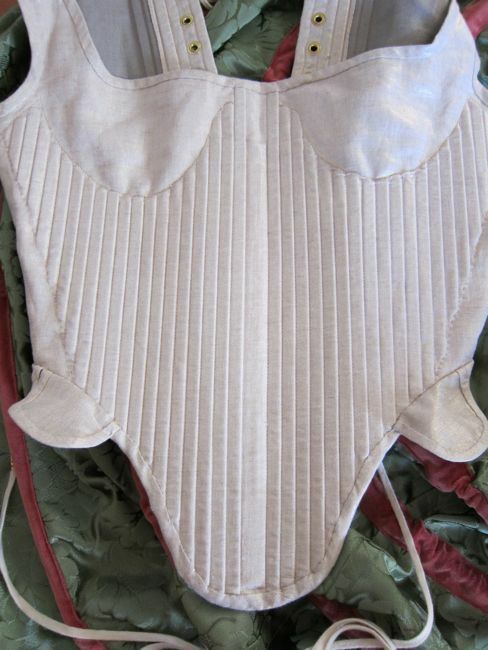 When I make a ‘real’ pair of bodies that is fully hand-sewn in perfectly period fabrics I’ll try reed with this pattern. Arnold indicates that the originals were boned in whalebone. In Mr D’s defense, he did happily take photos of me in the bodies over a shift, over my Mariana Victoria skirt (yay! It’s been worn! 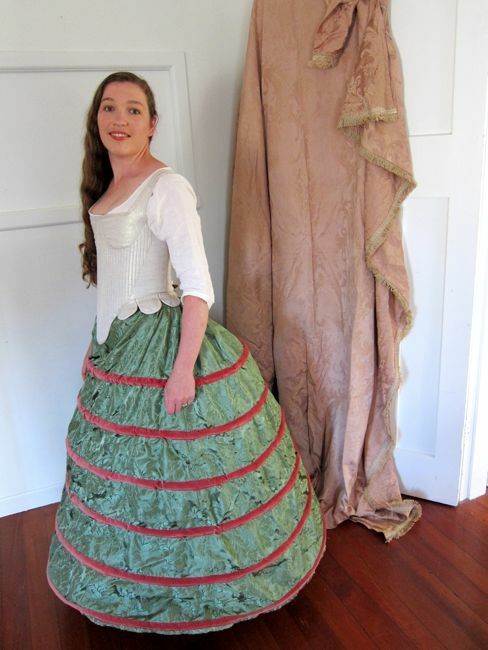 ), and with my farthingale. It looks quite festive with the farthingale. 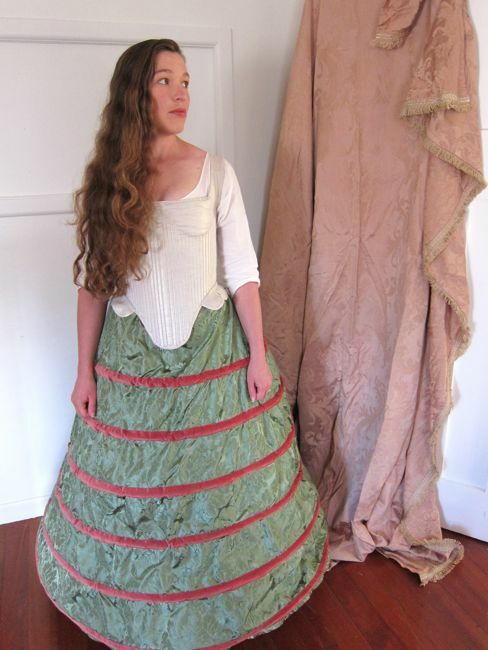 Like I’m dressed up as an Elizabethan Christmas tree. A bit of a comedown from Queen of the Amazons though! The pattern is almost entirely Pfalzgrafen Dorothea Sabina’s 1598 pair of bodies as diagramed in Janet Arnold’s Patterns of Fashion 1560-1620, but when I got to the finishing the very last bit (the waist tabs) I checked The Tudor Tailor’s version of the pattern to see how they did it, and realised that Arnold gives 3 tabs (small, medium and large) per side for the pattern, and TT gives four identical tabs. I suspect that Arnold’s version is more accurate to the original, but went with the TT four tabs anyway, because it worked out better on my body proportions. Pattern: Pfalzgrafen Dorothea Sabina’s pair of bodies as diagramed in Janet Arnold’s Patterns of Fashion 1560-1620, with slight reference to The Tudor Tailors version of the pattern. Notions: cotton thread, cable ties ($12) and metal boning ($5), metal grommets ($5), cotton lacing ($4). Hours to complete: At least 12. Even with machine sewing shortcuts, there is a lot of handsewing in these. I’ve been plugging away at them since mid November. 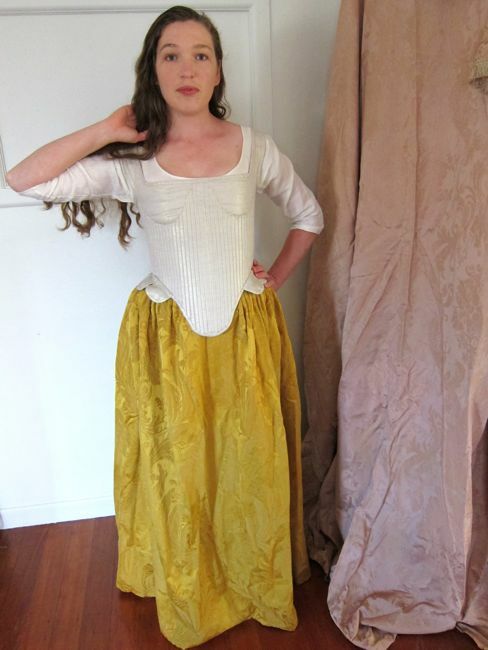 First worn: Wed Dec 3, without waist tabs, to demonstrate Elizabethan underclothes to a bunch of Year 9 (US 8th graders), and then again on Jan 1st for the photoshoot, properly finished. Total cost: NZ$40 or thereabouts. And, how could I do a post without including Felicity? According to her fluffiness, I’d better figure out how, because she objected to this photoshoot by the simple but expedient method of attempting to chew my hand off until I put her down! So pretty! 😀 I hope in 2015 you make a dress to go over your new lovely underpinnings! Thank you! That’s the plan – we’ll see how it goes! Her Fluffiness is out of luck: she makes a most adorable accessory! And this makes a most adorable pair of bodies. I really could see it in a masquerade! Oh, and interesting about the boning pattern. I wonder how that would work for larger cup sizes? I think it would be just fine for larger cup sizes – you might have to adjust the curves of where there aren’t bones, but there is so much support from the layers of linen and the busk that it would have no problem holding a lot more up. 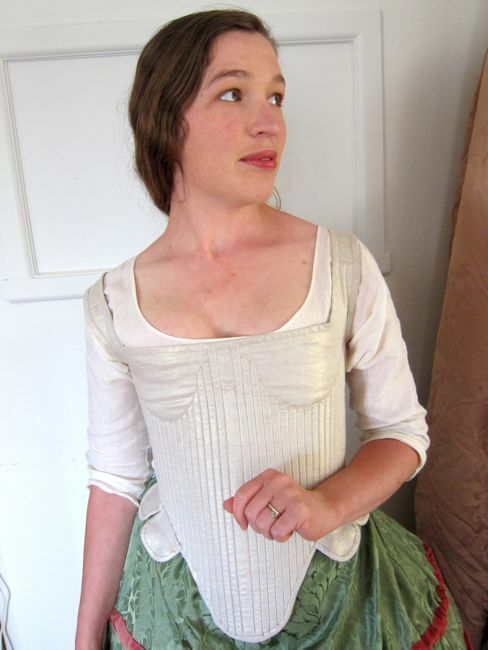 My sister dreams of a Renaissance dress one day (the original idea was a dream wedding dress), so I’m slowly gathering information on that… She likes the softer earlier styles, but she’s a much larger cup size, which I think rules out some of the softer support options. So I’m actually really excited about this midddle-ground! Yeah, Felicity is too cute to let be! And she wanders into photoshoots and goes ‘What’s going on?” so of course she gets picked up! And thank you! Felicity, rare Sabre-toothed Calico Battle Cat, companion of Leimomi, Queen of the Amazons! Wonderful. 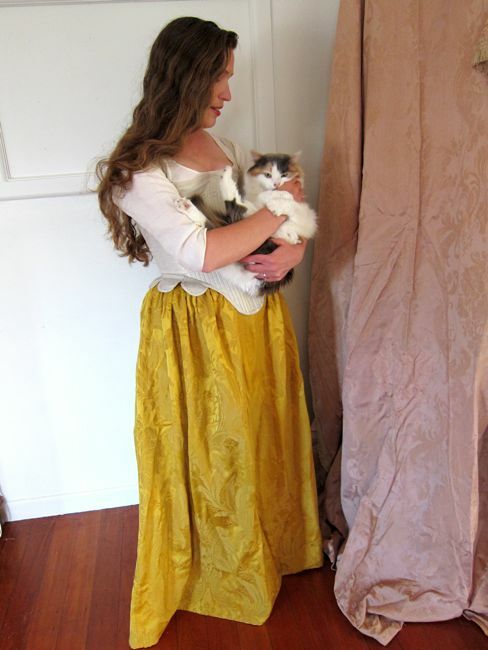 The pair of bodies look wonderful with both the farthingale and the golden skirt. They fit and sit beautifully, and I think the tabs are just right. People must have sized and numbered them to fit their own sizes, I’m sure. The scale is perfect. The gilt linen is so tempting in the store, but hard to decide what to make with…this is an excellent choice and your handwork is beautiful on those tabs! Thank you! I got tempted into 7 metres of it and have been trying to figure out uses for it ever since! :-p I did ‘cheat’ on the binding by making bias strips instead of using straight ribbon. 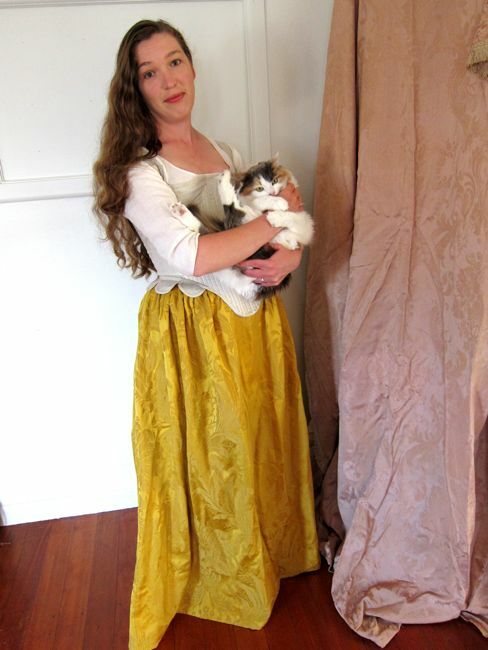 I had some dark red cotton sateen I’d intended to use, but it just didn’t look right. You’re hogging Felicity’s first cameo appearance for 2015! Ah Grace, true to form in your first comment of the year! That’s really cool! And your hair is SO LONG. Amazing. Thank you! Yes, my hair is getting a bit out of control. I keep meaning to schedule a hair appointment and then stuff comes up. Regarding cableties as boning, I have handled some of the wider ones and they seem awfully flimsy to me. Is this a problem or am I just imagining it? Also, your hair is so pretty. Are they your natural waves or are they braidwaves? The cable ties I use are 8mm wide and 45cm long, and they are perfect for boning stays/bodies/corsets. The boning in those garments isn’t really to ‘pull’ you in – the fabric does that. It’s to keep the garments shape, and shape your body in the same way. I’ve seen people recommend cable ties for boning bustles and paniers, but I find they just aren’t strong enough for that. Hope that helps! And than you about my hair. The waves are natural – I wake up every morning with a wild mess of curls. 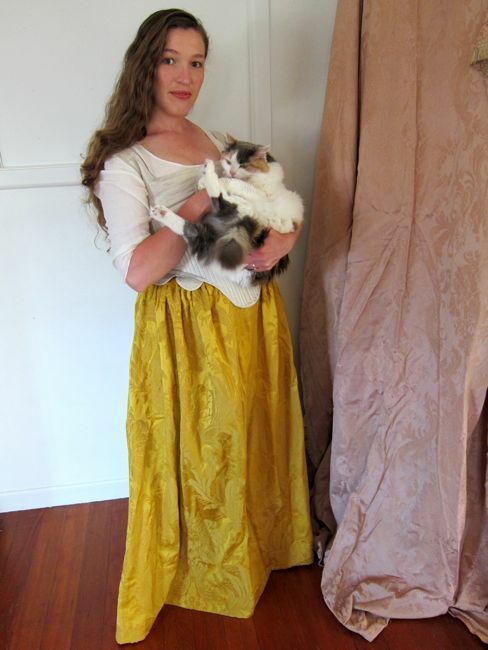 It might not be period-accurate, but they do look lovely in gilt linen. You could do a stunning Amazon Queen masquerade outfit with these, and you have perfect hair for it.